This might have been the best and the worst product I've ever used on my face, it it possible to love and hate something at the same time? In this case I have to agree on how crazy it is to even fathom such a thing, however you might just agree with the madness at the end of this post. 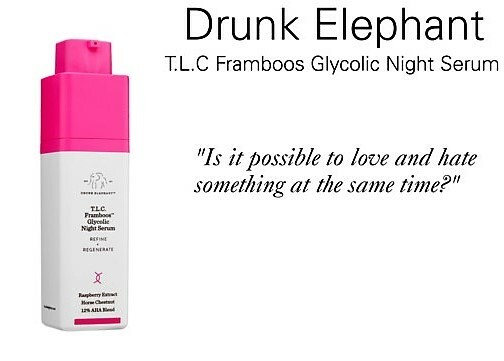 I tried to use the T.L.C Framboos Glycolic Night Serum for a full month before doing this review, however that was not possible because zits are the worst kind of greeting anyone can receive in the morning. This product did everything it said it would it brightened, my face over night, it gave me a smooth surface to apply makeup to expect for one thing in doing this it gave me one zit every time I used it. Because of this I could only use this two nights in a row and then give it a break. This has been happening for the last two months so I can only say things wont get any better. I'll give you an update next week, hopefully things get better fast!!! This high-tech gel resurfaces dull, congested skin, gently lifting dead skin cells away by gently dissolving the glue that holds them to the surface. The results are greater clarity and a smoother, more even-toned complexion. Formulated with a dream team AHA/BHA blend, T.L.C. Framboos™ sinks in easily and delivers effective chemical exfoliation without the harsh side effects like dryness or sensitization. Fine lines, wrinkles, discoloration, and other signs of aging will be greatly diminished, along with excess oiliness and the appearance of pores. Go from a drab complexion to an absolutely luminous one practically overnight. Water, Glycolic Acid, Salicylic Acid, Butylene Glycol, Citric Acid, Lactic Acid, Aloe Barbadensis Leaf Juice, Aesculus Hippocastanum (Horse Chestnut) Seed Extract, Arctostaphylos Uva-Ursi Leaf Extract, Camellia Sinensis (Green Tea) Leaf Extract, Rubus Idaeus (Raspberry) Fruit Extract, Buddleja Davidii Meristem Cell Culture, Saccharomyces Cerevisiae (Yeast) Extract, Vitis Vinifera (Grape) Juice Extract, Opuntia Ficus-Indica (Cactus) Extract, Sclerocarya Birrea (Marula) Seed Oil, Allantoin, Sodium Hyaluronate Crosspolymer, Propanediol, Xanthan Gum, Galactoarabinan, Hydroxyethylcellulose, Disodium EDTA, Hexylene Glycol, Caprylyl Glycol, Ethylhexylglycerin, Sodium Hydroxide (pH adjustor), Phenoxyethanol.